commented on "Dining Chair Reupholstery, Restoration, Repair, Repad, Respring, Reweb, Reglue and Recovery Service." Dining Chair Reupholstery, Restoration, Repair, Repad, Respring, Reweb, Reglue and Recovery Service. Need New Look! We have been repairing & recovering all types of dining chairs for over 20+ years. Fabric, Vinyl or Leather options available. We can re-glue joins if required. 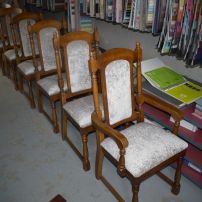 Send a pic of your chairs for a quote to enquiries@jaro-upholstery.com.au.